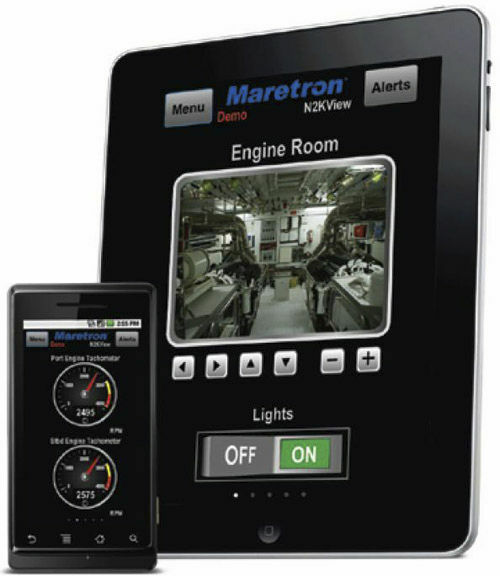 Maretron’s N2KView® Mobile software allows you to monitor and control your vessel’s systems from your smart phone or tablet device. This includes Android (2.2 and higher) smart phones and tablets as well as Apple iPod, iPhone, and iPad. Whether it’s onboard via WiFi or ashore via an Internet connection, you can see what is happening aboard your vessel and even control things like your air conditioner, watermaker, lights, pumps, and more. What makes N2KView® Mobile so diverse is its ability to configure your own screens. You have complete control of the number of screens, the layout of each screen, and the size and type of each parameter you wish to display. You customize each display exactly the way you want it. You use N2KView® on a computer to design the screens, and then download them to your smart phone or tablet device. N2KView® may be downloaded free of charge directly from Google Play to your Android device or directly to an Apple device from the iTunes store. Although the application is a free download, you will need a Maretron Internet Protocol Gateway (IPG100) to get the sensor data onto the vessels Wifi for onboard viewing or onto the Internet for remote viewing (see Maretron Cloud Services for remote viewing).